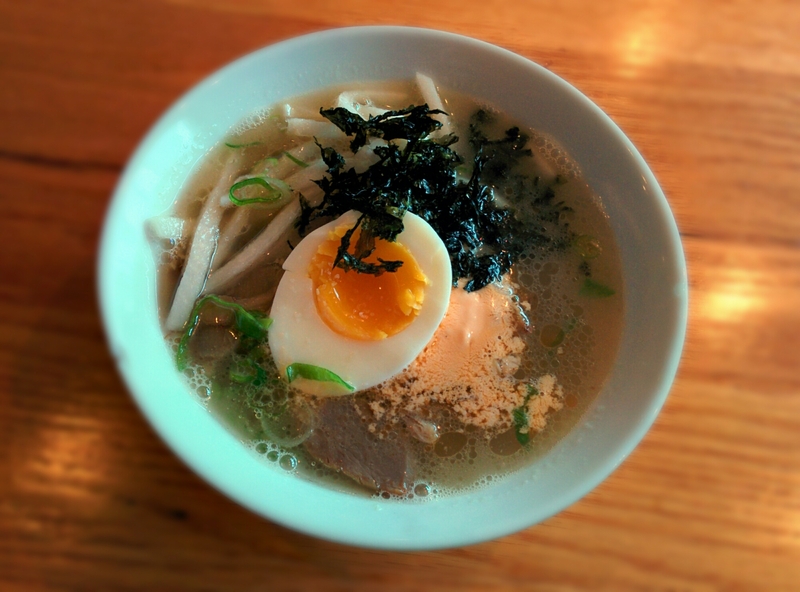 We’ve been on a bit of a ramen kick here in Boston lately as the ramen scene has been taking off the last few years. Some ramen shops have been positive experiences and others, not so much. 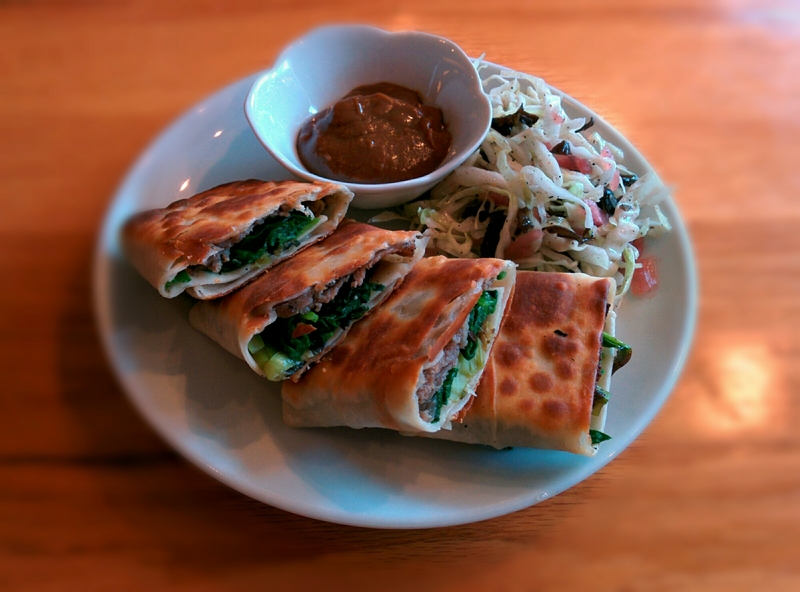 We’ve heard many positive things about East by Northeast and it has been on our list of places to try for awhile. Even on their website, they tout themselves as a “modern Chinese restaurant in Cambridge, Massachusetts that is casual, yet inspired” that serves tapas-like plates. On Wednesday nights, they have a ramen special, which helped us decide to make our first visit. 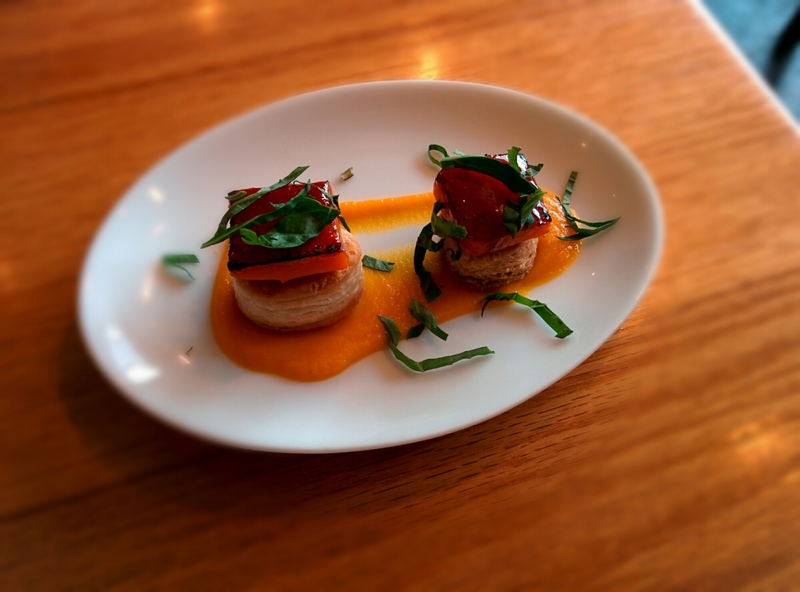 We started with a complimentary amuse bouche that was a delightful confit of carrots on mini biscuits. 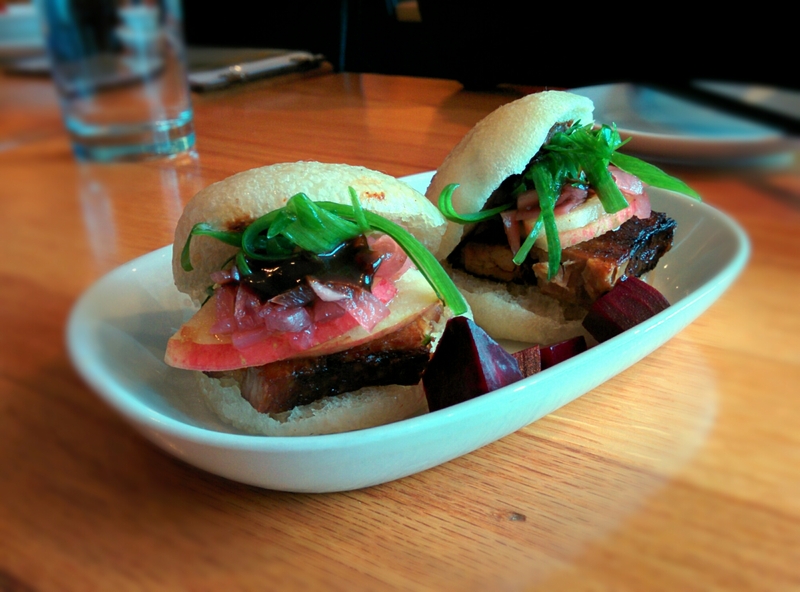 I have a soft spot for pork belly on soft mantou bread so it’s not surprising that we had to order ExNE’s version. Every bite was delicious because the richness of the pork belly contrasted well with the crisp sweet crunch of the apple combined with the tangy, sweet and sour crunch from the pickled purple onions and beets. We then tried a special of the day, which consisted of cured lamb loin, ramps and liver pate wrapped in a Mandarin pancake that was pan-fried. It was a refreshing take on a traditional Taiwanese dish that usually uses beef and scallion pancake together. This was amazing and I hope it becomes a regular menu item. The broth was initially fishy and sour, like Vietnamese canh chua, probably from the fish fumet and the pickles, until we stirred everything together. The broth turned out to be light and tasted rich due to the addition of ankimo, monkfish liver butter combined with the pork stock. The hand-pulled noodles were one of my favorite parts of this ramen. They had the requisite toothsome-ness that I desire. My second favorite part was definitely the half egg. It was perfectly cooked with a still slightly runny yolk. The pork was also very good. At $12 per bowl, the portion itself is relatively smaller than most of the ramen being served in Boston. Was that a deterrent? Certainly not, but if you are a big eater and can finish an entire bowl of jiro-style ramen, then consider ordering other dishes as well. Service was quick and polite. Prices aren’t cheap but they aren’t exorbitant either, given the quality and care with which each dish is made. We definitely will be returning to try more dishes in the future, particularly anything with hand-pulled noodles.